June 2014 update to this blog: The travel photography book project that I mention in this blog that I had wanted to create is done! It is called, “The Porches of Île d’Orléans: Seeing the Island through its Windows and Doors while walking Chemin Royal,” and it is available on Amazon. 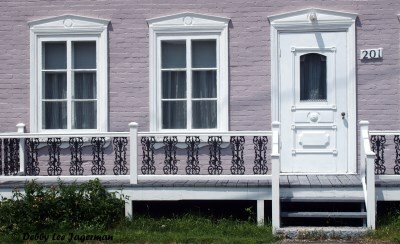 The porches of Île d’Orléans. 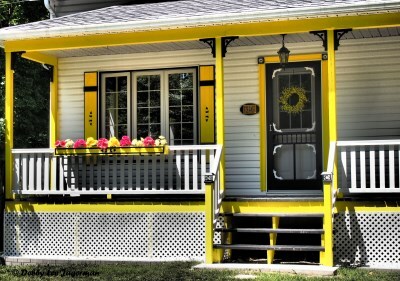 With their brilliant and varied colors, their adorned windows and doors, the decorations of flowers and other items displayed on the porches, and their many places to sit and relax. 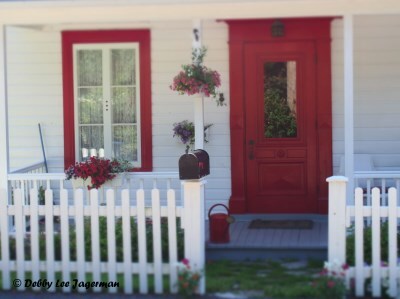 I just loved photographing as many porches as I could during my 42-mile walk around Chemin Royal (Royal Road) that encircles Île d’Orléans. And I photographed a lot of them! 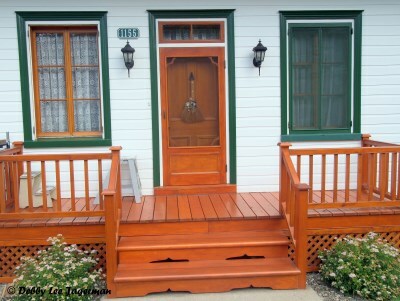 So my 41st reason, out of my 42 reasons to visit Île d’Orléans, is the fabulous porches. I wanted to learn more about the homes of Île d’Orléans, knowing that this island is full of history, so I did some research. From an interesting website I found on the family history and genealogy of the Lachance and Bussell families, of which the Lachance family has ancestors who lived on the island in the 1600’s, I discovered this from their Île d’Orléans history page: The architecture on Île d’Orléans “has a 350-year-old history. Many of the buildings have been deemed of great historical value. 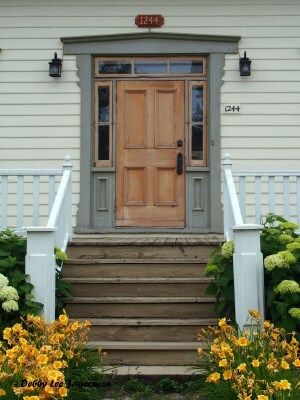 The first houses were patterned after the French houses that they were familiar with in France. The houses were small and centered around a fireplace that was used both for heat and cooking. They were built of wood with thatched roofs. As time passed they designed houses that were larger and more adapted to the weather conditions.” I find this kind of information completely fascinating. 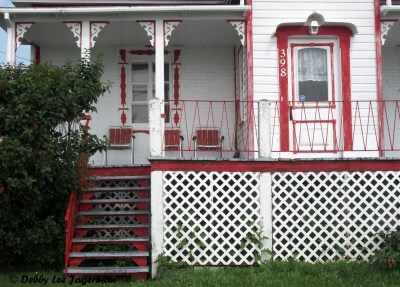 For fun, I also did a search and came across a few websites with homes currently for sale on Île d’Orléans. They advertise the property style of some homes as “heritage” or “ancestral,” with some for sale that were built back in 1820, 1821, 1847, 1889, and even 1786. How cool is that! 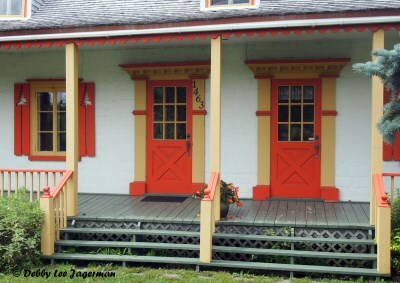 I loved photographing these fabulous porches of Île d’Orléans! 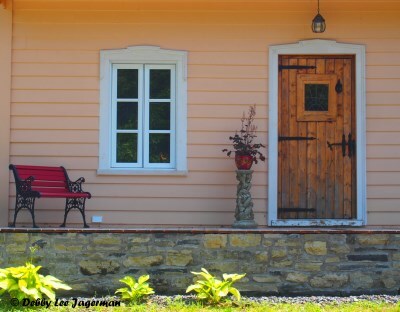 With the pictures in this blog, plus with the many, many more photos I took, I plan on creating a photography book on the porches, windows, and doors of Île d’Orléans. I am very excited about this project, and will post a blog when it is complete! I have written 41 reasons to visit Île d’Orléans. Ranging from the quiet, to the farmland and river scenery, to the many, many various arts and crafts. Ranging from the fresh roadside fruit stands, to the chocolate shops, to the maple syrup and cheese, to the fine dining in restaurants. From the aroma of lavender, to the wineries, cidreries, and vinaigraries. From the religion of the churches, procession chapels, and roadside crosses, to the restful accommodations. 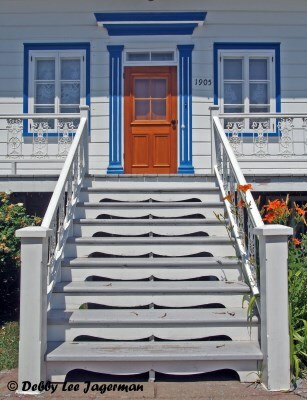 From the maritime history, to the mailboxes, and to the porches. However, the reasons go on. And on. And on. So my 42nd reason to visit Île d’Orléans is ALL the other reasons that I did not mention in my series of blogs. For example, there are many other specialty arts and crafts boutiques and galleries; there are antique stores; there are many other restaurants, bistros, cafés, and pubs. There are many more accommodations; a few other churches; and some historical homes to visit. There are other places that specialize in agri-tourism and specialty food shops, with an abundance of fresh fruits and vegetables depending on the season; there is a duck and geese farm; other wineries and breweries; bakeries; a fish shop and a place to go fishing; a theater and a museum; a genealogy center; a grocery store. One can take excursions on the Saint Lawrence River to other islands, play a round of golf, climb an observation tower, and visit a small petting zoo. There is a summer and day camp for children, a book store in a park, and depending on what month you are there, you may come across a special event. Based on this list, I’m sure that I could come up with another 42 reasons to visit Île d’Orléans and write a second series of blogs. The reason that I chose to write about “42” reasons to visit Île d’Orléans is because of the “42” mile Chemin Royal that encircles the island. I used mileage as my measurement because I live in the United States, where we measure in miles. However, if I lived in Canada, I would be using kilometers instead of miles. In kilometers, Chemin Royal is 67. Therefore, I suppose I could have done a series of blogs on the “67 reasons to visit Île d’Orléans” instead, and would have filled each and every reason. Again, my 42nd reason to visit Île d’Orléans is ALL the other reasons to visit this amazing island. Ok. I will throw in a bonus, a 43rd reason to visit Île d’Orléans – it’s close proximity to Québec City. In fact, you are more likely to visit Québec City first, as it would be your gateway to get to Île d’Orléans. And believe me, there are almost certainly 42 reasons to visit Québec City as well. Now that my series of reasons to visit Île d’Orléans is complete, I will actually be doing two more blogs on the island. The next blog is a “tips on walking” the island. I am one of the few to walk the island, as traveling by car or bicycle are more common, and I will share a few words of wisdom my from experience. My final blog will be a recap of all my reasons – kind of like a one-stop travel guide, helping with organizing your trip to Île d’Orléans. Before I end this blog however, I will say that I love Île d’Orléans. I fell in love with the island several years ago when I had the chance to visit for the first time, for only an hour. In that hour I knew I wanted to go back. Then earlier this summer, I had the chance to go back. Four days of walking the 42 miles. Taking notes for these blogs; taking thousands of pictures; talking to many people who work and live on the island; enjoying the scenery; learning about the history, culture, religion; visiting the shops and galleries and boutiques; eating and eating and sleeping, etc., etc., etc. At only about 73 square miles, this tiny island offers so much for the visitor. All I can say to end this series of blogs is that I would love to go back to Île d’Orléans yet again to see what else I can discover, and to come up with even more reasons to visit Île d’Orléans. Here is a list of my 42 reasons to visit Île d’Orléans, as well as a few other blogs, including My Travel Guide, My Tips for Walking, My Walking Tour, and My Book!! My Travel Guide to Île d’Orléans. Tips for Walking Île d’Orléans. #2 through #4. The Chocolate Shops. #5 through #10. The Wineries, Cidreries, and Vinaigreries. #11 through #16. The Churches. #17. The Aroma of Lavender. #18 and #19. Recycled Folk Art and Textile Weaving. #21 and #22. Strawberries, Raspberries, and Blackcurrants. Oh my! #24 and #25. The Art in the Garden and The Garden of Arts. #26 and #27. Procession Chapels and Roadside Crosses. #28 and #29. Maple Syrup and Cheese. #31 and #32. Woodworking and Blacksmithing. #33 and #34. The Farmland and The River Scenery. #35 and #36. Fine Dining. #41 and #42. The Porches and My “Final” Reason. 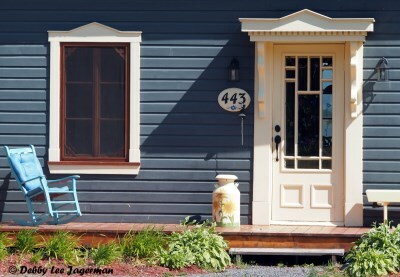 This entry was posted in Ile d'Orleans, Montréal and Québec City, My Photography Books, Windows and Doors and tagged Ile d'Orleans, Montréal and Québec City, My Photography Books, Windows and Doors by debbysdepartures. Bookmark the permalink. Debby for Mayor! I love it!